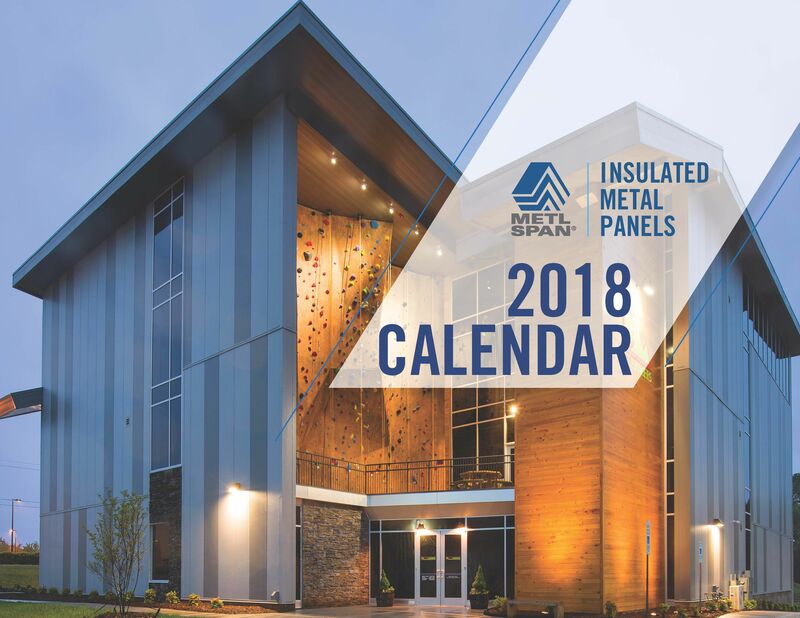 LEWISVILLE, Texas, December 13, 2017 – Metl-Span is releasing a 2018 calendar to highlight the company’s top 12 insulated metal panel (IMP) projects of the last year. The Cliff Hangers project in Mooresville, N.C., was voted by Metl-Span employees as the top overall project and was awarded the calendar cover position. Cliff Hangers is a state-of-the-art climbing facility, with everything from speed climbing to introductory classes, yoga studio, fitness area, café and kid’s climbing area. For Cliff Hangers, Metl-Span’s Santa Fe wall panels were specified by Cluck Design Collaborative of Charlotte, N.C., and installed by Baker Roofing of Raleigh, N.C.
Other projects featured in the Metl-Span calendar are the Huntsville Aquatics Center of Huntsville, Ala.; Liberty University of Lynchburg, Va.; Exeter YMCA of Exeter, N.H.; Sirna & Sons Produce of Ravenna, Ohio; Mohawk College of Stoney Creek, Ont. ; Streetscape Developments Inc. of Saskatoon, Sask. ; NY Film Hub of Syracuse, N.Y.; INIT Transportation of Chesapeake, Va., SORAA of East Syracuse, N.Y.; Atlantic Healthy Foods of Conley, Ga.; and The Ark at JFK Airport, Jamaica, N.Y.
For more detailed information on these projects visit the Metl-Span website.